Have you ever felt like you would like to bath after going to the bathroom? Or just want a mid day refresh? Wipes or toilet are the options, but nothing more refreshing than pure water! Skin irritation, areas not properly cleaned, excess of toilet paper or wipes cost, clogging prevention, rashes from infections, hemorrhoids. Those are a few examples of daily problems we front. Handheld bidet helps you to prevent or solve them all! Upgrade your toilet! Handheld bidet is both a luxury upgrade to your bathroom and a great investment in your health. Our bidet is a simple attachment that takes no new space at your bathroom and can deliver refreshing experiences. Women on period days? Clean the area every time you want to stay fresh! It's easy to install and need no expert plumber, just follow our graphic instructions. Our set is made of premium materials. 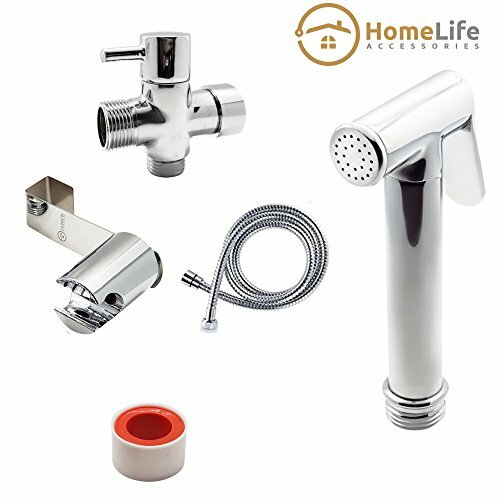 Solid chromed brass head and T-Valve, stainless steel flexible hose and dual mount that can be used with the toilet hanger or mounted directly on the wall. Moreover, we've included rubber seals in all connectors and extra plumbing tape in case you want to double guarantee no water leakage at all. Comes with standard 7/8' male and female connectors so all you need is included. With the T-Valve you can On or Off the water supply for the bidet and regulate the water pressure, so experience of use is customized for all family members. Even more, our bidet helps you on other applications as cloth diaper cleansing or toilet cleansing and rinsing. To ease your choice, we give you 100% satisfaction guarantee with 30-day money back and 1- year extendable to 3-year guarantee by manufacturer when you mail us your purchase! You wont regret upgrading your toilet! Add to cart and try our bidet now! Hand held Bidet & Cloth Diaper Sprayer- Solid combination of materials that will last for years in your bathroom. Chromed brass head, stainless steel flexible hose, dual mount mode and brass T-Diverter that can be installed on any toilet. All-in, Leakproof Quality: All you need to install in the box. Our graphic instructions take you step by step. Rubber seal in all connectors and extra plumbing tape for additional leak prevention included. On/ Off Regulator (T-Valve) let you set the intensity of the water pressure for customize individual comfort. Not just a Bidet: It is also convenient for cloth diapers, cleansing, rising sinks. Women found it to be a great hygiene support for period days of month. If you have any questions about this product by HomeLife Accessories, contact us by completing and submitting the form below. If you are looking for a specif part number, please include it with your message.